I’m pretty sure you are over fertilizing. Too much fertilizer can kill the plant. If you are using brand new soil, many come already mixed with fertilizer so you shouldn’t have to fertilize all season. If not, then once a month is plenty. I’ve never had much success growing tomatoes in planters (in the ground, yes). 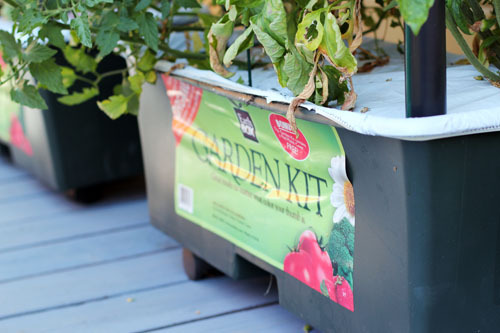 If it gets too hot, the plant fries in the box – so make sure you are watering well (veggie soil should always be moist). I didn’t plant a garden this year — thought it would be too much with the baby. But now I miss having fresh veggies that are literally just footsteps away. I’ve tried planting tomatoes in containers on the back patio with absolutely no luck. Early in the season, I get blossoms, and I may even get a tomato or two. But I live in Texas and my patio faces west, and I think the Texas summer sun/heat is just too much for patio tomatoes. Maybe next year I’ll plant them in the ground on the back fence to get some shade in the late/hottest part of the day. I’m not an expert, but I’ve read that tomatoes love sun and heat, but only up to a certain point. After 95ish degree (+/- 5 degrees?) consistent temperatures, they start to die. Also, in hot parts of Arizona, tomatoes are grown much earlier and are pretty much done fruiting in early July. Every year we plant tomato plants and they grow to astronomical sizes. We live in Northern California too (the East Bay) and the plants receive bright sunlight for most of the day. My mom, the gardener in family swears by a few things. 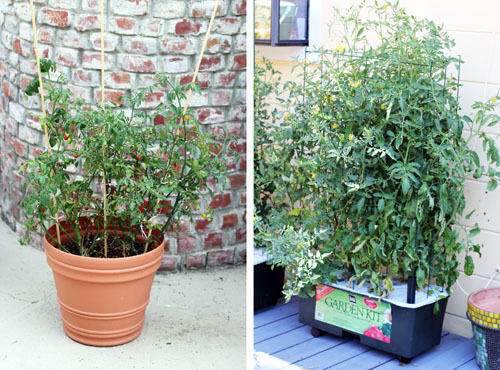 She only puts one tomato plant per large pot, apparently any more and it restricts their growth. 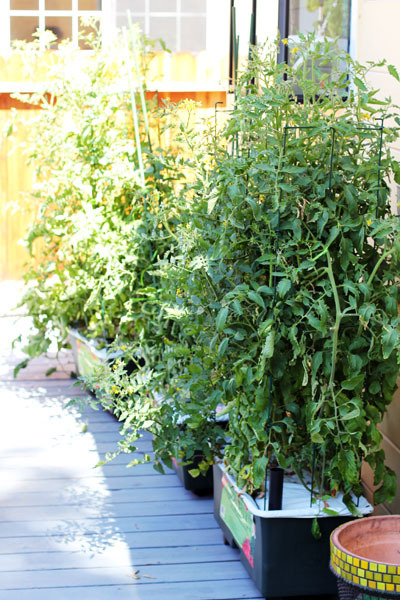 She also plants herbs around the tomatoes to fill up the base, but they are help keep the bugs away. Hope these tips help! I’m also not an expert, but lots and lots of sun is what they need. I have a few pots on my deck, but unfortunately all the local animals keep lunching on them! I need to find a way now to keep them from getting eaten before we pick them.